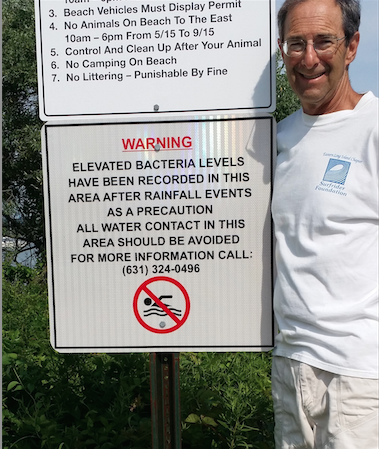 Just one year after they began their BWTF water testing program, the Eastern Long Island Chapter and their partners at the Concerned Citizens of Montauk have already succeeded in generating better public awareness of a chronic bacterial pollution problem at a local beach. Three of their water sampling sites are located at an enclosed bay beach on Lake Montauk that once had an officially designated bathing area but has since been closed due to water quality concerns. Unfortunately this beach is still favored by families with small children because of its calm water conditions. The Chapter’s water quality data has demonstrated that the bacteria levels at this beach and in the two freshwater creeks that flow into the Lake nearby often exceed health standards, and they have convinced the Town of East Hampton to post permanent signs at the beach warning of the chronically polluted conditions. This is only the first step towards their bigger goal of finding and fixing the sources of bacteria pollution in Lake Montauk, but it is an important one. The new beach sign will finally inform the people and families that use this beach that there is a pollution problem, and hopefully they in turn will help build the political pressure needed to identify the problems and take corrective action. Learn more about the Chapter's water testing program and local water quality concerns on the BWTF website.